In October of 2002, history was made when Secretariat became the first Thoroughbred horse to be represented in bobblehead form. The bobblehead was exclusively produced and distributed by Secretariat.com in an edition of 1000 total pieces with the original selling price of $73.00 ea. It was produced in conjunction with Secretariat’s owner Penny Chenery, with a portion of the proceeds from each doll benefiting the Kentucky Horse Park Foundation. This edition is now known as the First Limited Edition Secretariat Bobble. It is distinctive in that it shows Secretariat in a galloping pose wearing a RED saddlecloth with the number 1A, which he wore to victory in the 1973 Kentucky Derby. Measuring nearly 11″ long and 7″ tall, this edition came with a certificate of authenticity notecard showing a watercolor image of Secretariat during a morning workout and was hand-signed and numbered by Mrs. Chenery. The First Limited Edition Secretariat Bobble sold out in approximately eight days, enjoying immense popularity that can be attributed to the continuing appeal of Secretariat as well as being the unique first offering of an equine bobblehead in a horizontal form. It is now considered one of the most valuable bobbleheads ever to be produced, with sale prices now reaching as high as $1400 (Sept, 2017) on the secondary market. They are occasionally offered through collectors or on eBay, but these offerings have become increasingly few and far between. Their rarity and collectible significance ensures their investment value will continue to rise. Due to an overwhelming number of requests from individuals and collectors who missed the first offering, the Second Limited Edition Secretariat Bobble was released in January of 2003. This edition was produced in a quantity of 1,973 pieces, again selling with the original retail price of $73 each. The second edition also known as the Belmont Edition is distinctive in that it is large, measuring 11″ x 6″ and shows Secretariat in a stretched pose in mid-stride wearing a white saddlecloth with the number 2 that he carried to victory in his record-breaking 31-length victory in the 1973 Belmont Stakes. 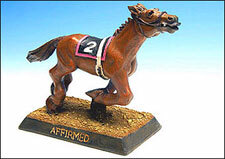 This bobblehead also came complete with a signed notecard certificate of authenticity showing a graphic representation of Secretariat on the cover and a black and white watermarked photo image on the interior. The Belmont Edition sold out in September of 2003. Because of the larger edition number, this edition is more readily available with secondary market prices for excellent condition pieces currently in the lower triple figures. We expect this edition to continue to increase in value on the secondary market over the next several years. In June of 2003, in conjunction with Churchill Downs, a miniature version of the Secretariat Bobble was produced by Secretariat.com as part of a Triple Crown give-away promotion also featuring the mini-bobblehead versions of Seattle Slew and Affirmed. 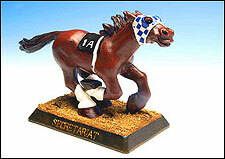 Although the Mini-Bobble Secretariat was produced in a pose similar to the larger First Limited Edition Secretariat Bobble, it is distinctive by its smaller size being 7″ long and 5″ tall as well as its BLACK saddlecloth showing the number 1A. 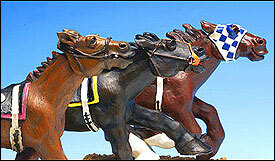 It also has slightly different forelock and mane and the year 1973 engraved on the back of its pedestal base. The Mini-Bobble Secretariat has shown the most varied range within the collectible market due to differences in its distribution. It also has the most erroneous information describing it on several eBay listings. To set the record straight, the Secretariat mini-bobblehead was produced in a total run of 15,500 pieces all with a corresponding individually numbered certificate card of authenticity. 10,000 of these were allocated to Churchill Downs for their give-away promotion and internal usage. These 10,000 have “Churchill Downs engraved on the front of the pedestal” and their card numbers begin with #5001. The remaining 5500 pieces were allocated in the following manor: 500 to other Churchill Downs tracks and employees, 4000 to the Kroger Grocery store chain within the Louisville and Lexington areas of Kentucky, and 1000 to Secretariat.com for online sales at a $24.95 retail price. Contrary to what many people think, it is the retail versions of the mini-bobble which are less common with production numbers being about half those of the Churchill Downs version. Of the 5500 allocated for retail sales, Secretariat.com retained the first 1000 pieces with their corresponding certificate cards with 150 of these 1000 being sold individually and the remaining 850 sold in sets with the retail versions of the Affirmed and Seattle Slew mini-bobble models. It is only through Secretariat.com and a few select retail partners that matched sets (which offered the same number certificate card for each of the three horses) were available for purchase. The market status of the mini-bobblehead varies but all versions have long since sold-out. Typically, mini-bobbles can be found on secondary markets usually through eBay, but very rarely as matched sets of three which are further distinguished by the certificate numbers being lower than #1001. Currently prices are between $350-$400 for the complete Triple Crown matched set of three and these prices appear to be gradually climbing. More commonly the Kroger allotment of mini-bobbles (certificate cards #1001 – #5000) can be found but only as individual non-matched pieces. The Secretariat mini-bobble is by far the most coveted of the three mini-bobbles with prices nearly doubling those of Seattle Slew and Affirmed. The mini-bobble versions that seem to be the most readily available on eBay are usually from The Churchill Downs Give-A-Way Promotion (certificate cards #5001 and higher). 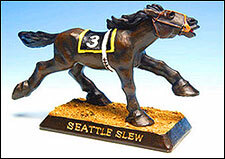 Prices can range between $35-$75 each with the lower end of the prices usually reflecting Seattle Slew and Affirmed, or poorer condition versions offered by fans who attended the promotion event, received their free bobble and choose to sell for a profit. 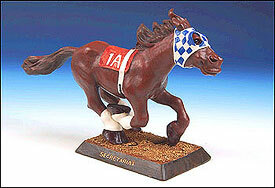 The fourth and last Secretariat bobblehead edition to be produced was the 2004 Secretariat mini-bobble, also known as the Prancing Edition. The most readily accessible Secretariat bobble, the prancing edition was produced in conjunction with the Bronze statue unveiling at the Kentucky Horse Park, primarily for wholesale and retail sales. 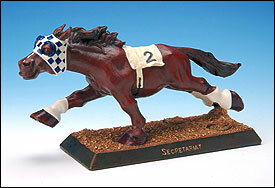 Approximately 7″ long by 5″ tall, 12,500 were produced featuring Secretariat with a black saddlecloth wearing 1A signifying his Kentucky Derby victory. This edition did not come with any corresponding certificate card. Like all Secretariat bobbleheads, the prancing edition sold-out, and has now attained a very collectible status in its own right with prices reaching $175 or more. The prancing bobble is the only edition that was originally offered with the option of being signed directly on its base by Mrs. Chenery. Only about 150 were signed in this manner and their collectible value increases dramatically as in any Secretariat memorabilia actually signed by an original Meadow Stable team member. We recommend you contact us at Secretariat.com to help locate your specific requests as we are constantly searching for rare Secretariat collectibles. Our network also consists of several fans and collectors who will occasionally ask us to broker the sales of their Secretariat memorabilia (Click Here for our current inventory of sold out Bobblehead Editions). For editions we cannot locate, we encourage you to check eBay and other similar internet auction houses. Nothing is definite but there has been continued discussion to produce a third and final Limited Edition Bobble showing Secretariat wearing a saddlecloth with the number 3, the number he carried to victory in the 1973 Preakness Stakes. This would be a fitting finale to complete the larger Limited Edition set representing all three of Secretariat’s victories in the Triple Crown. The dolls were made by choice this way to convey a humorous approach. To Mrs. Chenery, a bobblehead Secretariat seemed more fitting to have a whimsical, fun quality rather than a rigid realistic feel. No, this was to minimize handling during their productions. Only their corresponding cards were numbered. AP stands for Artists Proof and these are the rarest of the Secretariat bobbleheads. There were only about 20 produced for each of the two larger limited editions, primarily to be used for Mrs. Chenery’s personal usage. It is very uncommon to see one available on the collectible market. They are most likely to be found as an auction item offered as part of a charitable event. You can contact Secretariat.com if you have questions about a bobblehead certificate’s authenticity. Only time will tell, but any new Secretariat edition will have a completely different pose from previous models. Register below to sign up for our website newsletter to stay informed about pre-publication offerings.